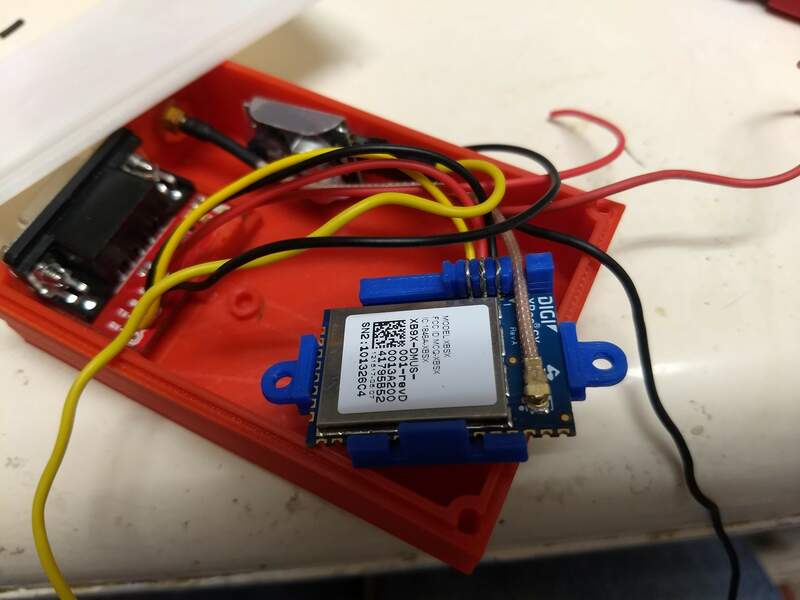 I was just wondering if the 1W Digi Xbee-Pro SX module would be compatible as a base transmitter with the current LR kit 20mW XBbee-SX receivers as rovers? Possibly would have to have a separate external supply to the module? I have been playing around with my LR kit and am very happy so far, worked straight out of the box. The rover gets RTK Fix very quickly from a cold start and after mounting the antennas on 200x200mm ground planes it maintains a fixed solution well. They also fitted nicely in the pelican boxes i ordered, just waiting on another SMA pigtail to finish off. Have you made the xbee-pro work? how hard is it? I'm using an older version of the Xbee SX Pro module and it's very simple. For RTCM out, the TX line from the SimpleRTK2 ( or Sparkfun's RTK2 board) uart goes the data in pin on the Xbee SX Pro. The SimpleRTK2 can be set to use either 3.3v or 5v for the TX output. My older radio (9xtend) is 5v. But all the newer ones like the SX and SX Pro are 3.3v, so it's just a matter of applying 3.3v to the vref input on the SimpleRTK2. The Sparkfun units are all 3.3v so TX can go directly to the SX Pro. I'm using SX units on the rovers, so that's all 3.3v there. The data out line from the SX goes to the RX uart line on the F9P. Over the air speed is 112500 and I am using a uart baud rate of 57600. I tried 38400, but if I turn on all the MSM7 messages in the F9P, it's too much for that speed. The problem with the SX and SX Pro is the form factor. It's got little solder dimples around the edges of the board, spaced 1mm apart. There's really no socket you can buy for that. It's intended to be soldered to another circuit board. You only need at most 4 wires to make the SX radio work. Ground, 3.3v power, data in, data out. The rest of the "pins" are for additional features. For testing purposes I have created a litte 3d printed socket that makes it somewhat easier to use the SX and SX pro modules. Basically wires come in and wrap around channels (can be glued in), and touch the dimples on the side of the module. I can post an STL file of this if anyone wants it. Amazon.ca has a nice 3D printer for about $300 if anyone wants to go down that fun rabbit hole! Kaupoi, WTalen and ropecope like this. Last edited by torriem; 04-15-2019 at 12:10 AM. Does anybody know if it's possible to get an RS232 port out of the SimpleRTK2B board? The docs say RX1 and TX1 lead directly to the F9P UART. Sure the UART can output NMEA at any speed you set in u-center. It's TTL serial though. You'll need to run that through an RS232 converter to get the -12v/+12v that RS232 uses. In my picture in the previous post I have a little RS232 converter board that I use. But there are many on amazon and ebay that would work. Make sure your voltage requirements are met. If you're using the SimpleRTK2, you can provide 5v to the Vref pin and all your uart pins will be at 5v, which is common for a lot of RS232 converters. Some can work at 3.3v. Also most TTL serial input circuits that are 5v can still detect a signal coming in a 3.3v. You just don't want to feed 5v to an input that expects 3.3v. Last edited by torriem; 04-15-2019 at 09:37 AM. So tonight I burned out both my SimpleRTK2 boards. Culprit appeared to be a bad antenna, although I had no idea what would have caused it to fail so suddenly. Found the culprit, though. Somehow plugging it into one of my pigtails (maybe it was a bit tighter on the pin? ), the center pin of the SMA connnector got pushed into the plastic part. This internally caused a dead short in the SMA connector to the outer shield. This fried my F9P's GPS RF receiver. Everything else worked. The worse bit is I brought it back into my office, soldered headers on my spare board, stuck it in, and it worked fine. But outside I hooked back up to the bad antenna, not realizing the SMA connector was shot, and blew out the second board! Sigh. I thought I read that the F9P could detect antenna shorts and disable the RF stuff temporarily, but alas my boards appear to be quite deaf to GPS signals (u-control can still talk to them). Maybe I'll leave them running all night and see if they magically decide to work, but I doubt they will return from the dead. So be careful with these SMA connectors. Wouldn't hurt to inspect them and makes sure that center pin is still sticking out like it should. I've plugged other antennas into these pigtails and never had a problem, so I'm wondering if this wasn't just a defective SMA on the u-blox antenna. Anyway, I guess I'll plunk my $260 down on a new board. I fried a board to. I think it's the pigtail i bought on amazon. to small a hole. I noticed it was a bit tight when putting together but thought it worked. later noticed the center pin on antenna was pushed in a bit. That very well could have been my problem also. However my second antenna fit the pigtail just fine. So I think the quality of the pigtail wasn't so good but the quality of the antenna sma connectors also isn't that good if a pushed in pin can cause a dead short. I have another antenna (not a GPS antenna) with a center pin that's kind of loose and sometimes pushes in but it does not short out. Makes me wonder if U-Blox doesn't have a batch of antennas that got low-quality SMA connectors. I'm inspecting the connector every time I plug it in. And I check to make sure it goes in smoothly and easily. I've switched to my small supply of Sparkfun RTK2 boards for now. I have to use a u.fl pigtail with that and it seems to mate with antennas just fine. 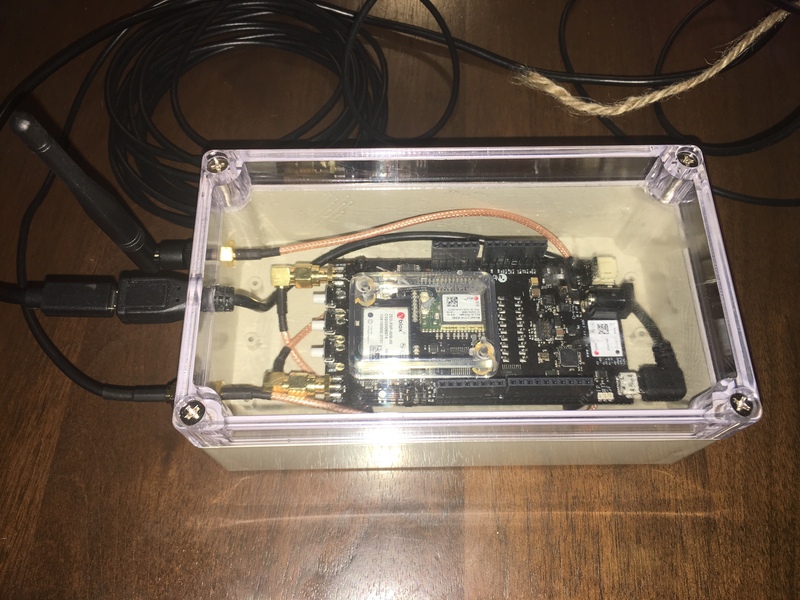 One downside of the SimpleRTK2 design is that the antenna connector cannot easily be mounted inside an enclosure without an extension pigtail. 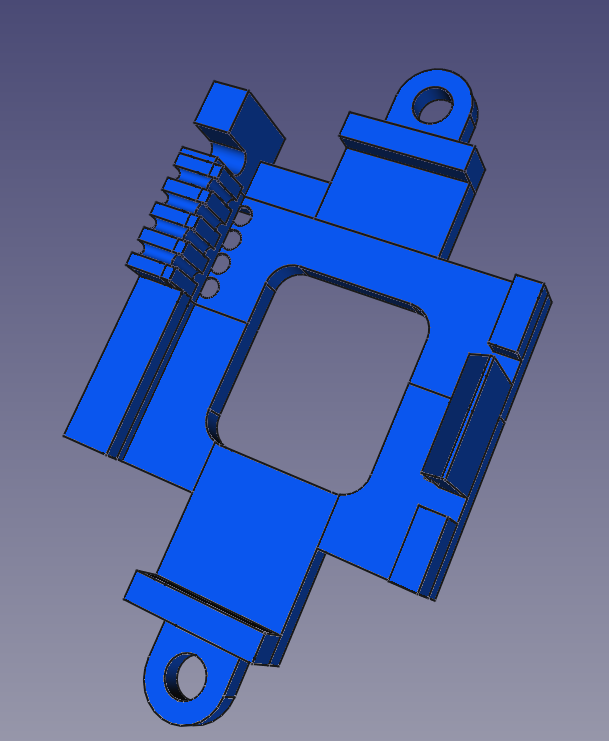 They really should have added a secondary u.fl connector on the board for a proper bulkhead pigtail. I've seen other GPS boards that did this. WW and holgerhey like this. Last edited by torriem; 04-15-2019 at 08:57 PM. Been playing around with the UBLOX C099-F9P development board for the last week. This is uses the L1/L2 Ublox F9P in their own development board. It's available via digikey for 249, includes the antenna and a ground plane. Still quite impressed with the unit. It holds fix much better than the L1 only units (not really a surprise, but still nice). I'm struggling to get bluetooth or wifi working properly, but I have been able to get USB to work well. I've connected to AgOpen and can sent NTRIP in via the built in AgOpen NTRIP service. Definitely this is the path I'm focused on going forward. I've been able to build a python script (running in parallel with AgOpen on the same computer) that takes this plus the KVH C100 digital compass and combine the two into a $PAOGI sentence and sends it to localhost. Was suprised that I could send in PAOGI via UDP and still have AgOpen send out the NTRIP via COM port. Kudos to the flexibility of the software Brian.